Straight after the Canary trip we flew back to Austria through DÃ¼sseldorf. We had just 1 and a half day to organise things for a 3 week Turkey-Greece trip, pick up the post, pick up a repaired sail, getting the right gear sorted out. What a stress! Thanks to the help of our friends JÃ¼rgen and David we got lifts from the airport to our home and the other way around. Travelling with 4 boardbags and two big bags to Izmir through Istanbul was a big workout. When we arrived at our final destination in Izmir, not one bag had been arrived on the belt. It needed us more than 6 hours waiting at the airport for all the gear, which got delivered by Turkish Airlines time by time. Late at midnight we arrived at our Hotel, called Otel Bakirli at Alacti. The competition started straight on the following day and my motivation was down. I felt so tired plus the motivation was a bit down. All my gearbags were directly in the sun, no shade available. I had been arrived too late definitely this time. Plus went on too big gear, using my 9,6 m Reflex too often. I definitely should have changed to the 8,6 quicker, which fits extremely good my body size and weight for light wind. No shade for guys, who were a bit later arriving. That was my spot. I managed to get a 5th in the first round of the first elimination, which was not enough to advance in the quarter final, but was okÂ sailing on the big gear fully overpowered. 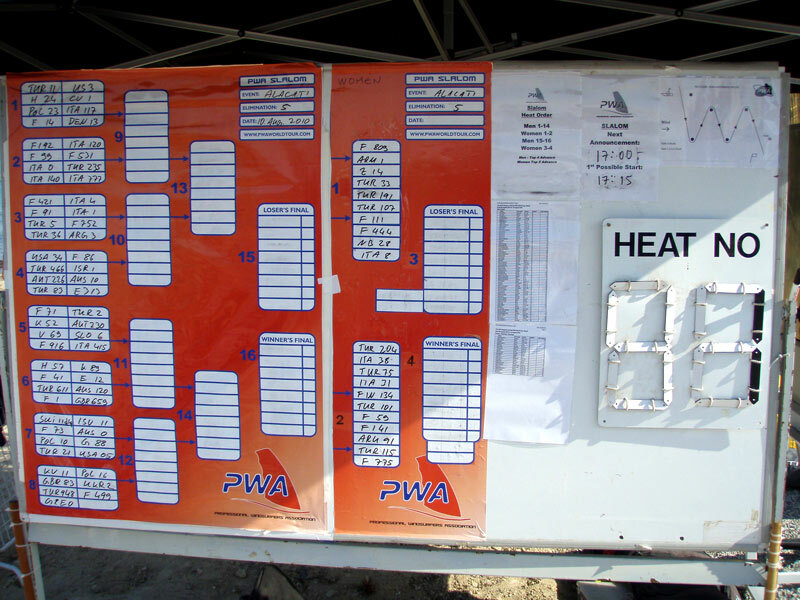 In the second elimination the PWA racemanagement went with a new seeding system sailing in groups of 11 people in the first round. I just passed many people swimming at the first mark, when a Turkish sailor pulled his sail against my boardnose and I got locked inside his boom. That was extremely bad luck just finishing in 10th and second last position of this round. What a nightmare! I got so high points! For sure the discard! 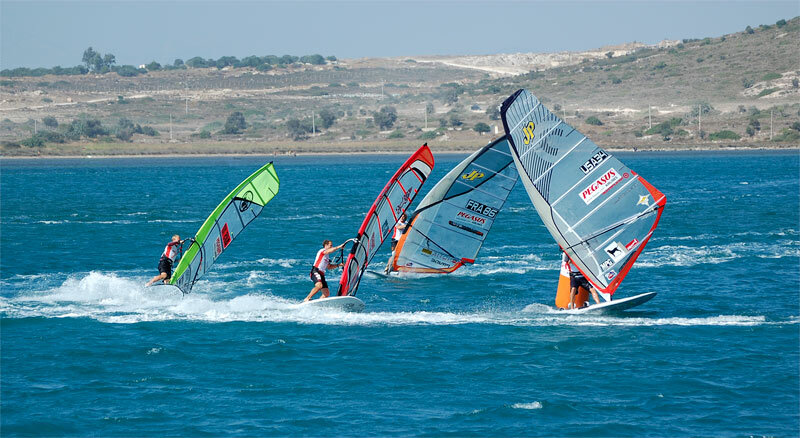 In elimination 3 I saw myself with a worldclass fleet in the first round: Maynard, Dunkerbeck, Williams, Mortefon. The start was slow and I finished 7th out of 8th. In the 4th race, we also sailed on day 2 of the event – Â I felt less tired, more aggressive again and started quite good together with Cyril at the top near the boat. I could not overtake Cyril, so I had to take the direct shortcut to the mark behind his tail, sneaking in in front of some guys and showed up in front of Cyril after the jibe, but without speed at the end of the mark one. It needed me too much time to pick up the speed again. Cyril and Andrea overtook me easily. I always stayed close to Andrea Cucchi, who was in 4th position, but never had a chance to attack him. 5th again! Elimination number 5, which never saw a valid result! After day 2 the wind dropped completely, just went for freesailing, testing, tuning, repairing a broken batton. Thanks to Kerstin, Gunnar Asmussen and Ben van der Steen for the help! On the final day, the 14th, we saw some little comeback of the Meltemi. Good position in race 5 (Pic: by Karo). I decided to go with the iSonic 131 tuned by the Pfaffi fin 48,5 cm plus the Reflex 8,6. I had a ok start up at the boat, but felt good speed plus free wind and could pass Jesper Orth on the first leg following Arnon Dagan and the eventleader Micah Buzianis. Jesper overtook me at the second jibe again, because I opened him the door jibing to wide, but the Danish Aussie struggled at the 4th and I came in third position again. Damien Le Guen could not get me this time. I was extremely happy making it up in the quarterfinals. And it did not feel like hard work. I had freewind and stable speed cruising through the lulls. Before the race I got my boom up by 5 cm, which perhaps helped me to find a more stable position on board. Unluckily this round did not see 12 valid runs and the result did not count anymore. Next time I will continue with a heat like I finished here at Alacati! 4th at jibemark 3 just behind Jesper Orth. Leading is Arnon in front of Micah (Pic: Karo). I only finished in 49th position at Alacati, which dissapoints a lot. Overall I lost 4 positions as well and felt back from 38th in 42nd position. 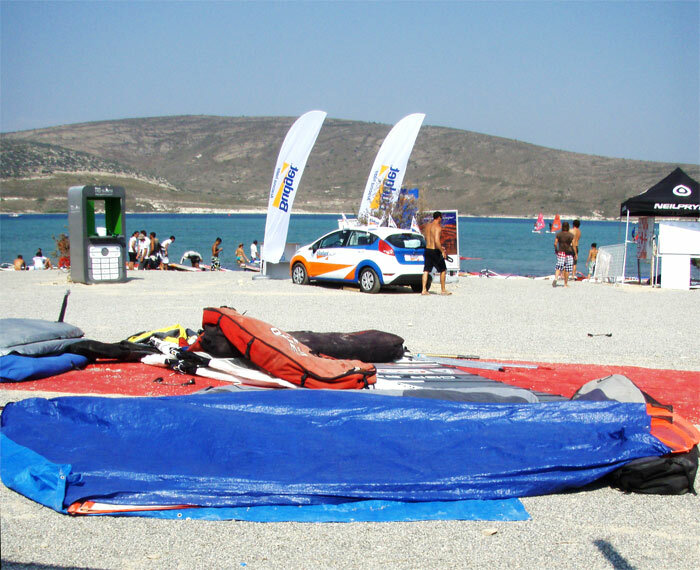 It was the fourth time competing in Alacati, but was my worst result so far. The fifth race would have changed my result a bit. One more race is on the calendar, the final at Westerland, Sylt, which starts on the 23rd of September. I will get myself tuned as good as possible and show, how good I am. See you on Sylt!